Thank you for choosing LUNE artwork! Here's a few commonly asked questions about our graphics. We create stock illustrations, clip art and graphics for you to incorporate into your own designs. We provide high resolution digital files that you can download instantly and begin working with straight away. We specalise in digitally hand drawn graphics of a cute, whimsical nature. Our graphics are perfect for digital scrapbooking, invitation design, and wall art. WHAT CAN I DO WITH LUNE ARTWORK? HOW DO I USE LUNE GRAPHICS? Our graphics are created in Adobe Creative Cloud software and should be compatible with Adobe Photoshop, Illustrator and InDesign CS4 and higher. If you are using programs other than the above to create your designs (such as Gimp, Paintshop Pro, Corel Draw or Microsoft Word) we strongly suggest you download one of our free artwork samples to check for compatibility with your program before purchasing LUNE graphics. Due to the digital nature of our artwork we cannot provide refunds for files that are not compatible with your software. Please also note that basic graphic software skills will be required to manipulate the artwork. Due to time constraints we cannot provide free tutorials on how to use Photoshop or other graphic programs. Youtube has a lot of really good resources, such as this tutorial on How to use clip art in Microsoft Word to make an invitation. 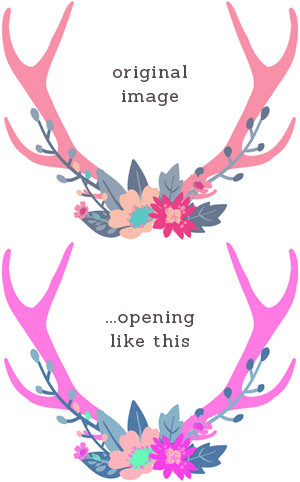 Alternatively you can print the graphics from your home printer or local print shop and use the artwork as you would for traditional scrapbooking. WHERE CAN I BUY LUNE GRAPHICS? Artwork is available for instant digital download from our online Etsy store, FRANCEillustration. It's quick, easy and free to sign up. ARE LUNE GRAPHICS FREE TO USE? LUNE artwork is free to use in your personal projects, such as wedding invitations or party packs. All we ask when artwork is used for a personal nature is that we are credited with a link back to our Etsy store if you post images of it online. If you wish to use our artwork for commercial purposes either on or off of Etsy (wall art, invitations, etc) you can do this for free, however you must provide credit to FRANCEillustration (with a clickable link to our Etsy store) wherever and whenever it's used. If you do not wish to provide credit, or it's not feasible/possible to provide a clickable credit link clearly beneath the artwork wherever it us used (such as logos, website designs, printed merchandise), you must purchase a Commercial License to use without credit. At no time can LUNE graphics be claimed as your own, offered or resold as-is. They cannot be resold as-is on sites such as Zazzel, Society6 or Cafepress. They must be incorporated into your own unique design. WHAT FILE FORMAT IS THE ARTWORK PROVIDED IN? PNG format: for screen use. 300 dpi High Resolution RGB PNG files on a transparent background. PNG are perfect for on-screen use, such as website design or online flyers. They are a good file format to have in your pack, because this file format allows artwork to save with a transparent background. This means you can incorporate the artwork into your own designs more freely. Please be aware that PNG files are NOT ideal for printing. They are set up for RGB (screen viewing), whereas printing requires CMYK for more accurate colours. The reason we provide PNG files so you can create your own unique designs out of them, but you will still need to save the artwork correctly for printing yourself. This usually includes flattening the artwork and saving it as a TIFF or JPG file, with colours converted to CMYK for printing. 300 dpi High Resolution CMYK JPG files on a flat white background. Our JPG files come set up ready for CMYK printing. These are perfect if you want to drop the image straight into your design and hit print. Due to the nature of JPG files it is not possible to save them on a transparent background, but all are provided on white ("White" does not print). If you need help feel free to contact us for a commissioned design. HELP! MY PNG IMAGES ARE PRINTING WITH A BLACK/SHADOWED BOX BEHIND THEM. 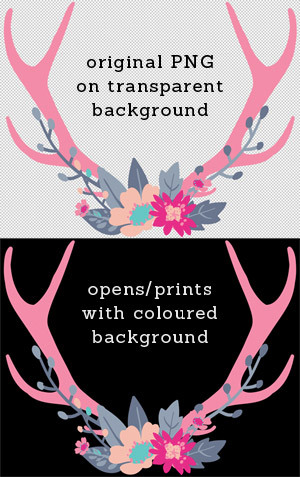 A transparent PNG means that the image will have no background - it's transparent and devoid of colour. When opened in some graphics programs the background might appear black, or white, because the background in the clip art image itself is empty and the program is unsure of what to fill it with. It is for this reason we recommend you download a sample of clipart from our free page to check first and make sure that any artwork you purchase from LUNE will be compatible with your software. Odd coloured backgrounds can also occur when you are attempting to print artwork that is not correctly set up for CMYK printing. Please ensure that the graphics you are attempting to print are CMYK, and check that your document settings are set correctly for print. We also recommend you use our graphics in artwork/photo specific editing software. Graphics may print incorrectly if you attempt to print from Powerpoint or other non-print standard software. It is not recommended to print from PNG files. PNG are better to create your unique designs with, then save them as a more appropriate file type for print. To do this you will need to flatten the artwork and convert it to CMYK colour space, then save it as either a JPG or TIFF. Please note that due to time constraints we are not able to assist people in setting their artwork up for print. Please also know that due to the digital nature of our artwork we cannot provide refunds for files that are not compatible with your software. Please visit our Free page for samples to check compatibility before purchasing. If you require help creating an invitation or similar project using our graphics you can commission us to do this for you. HELP! 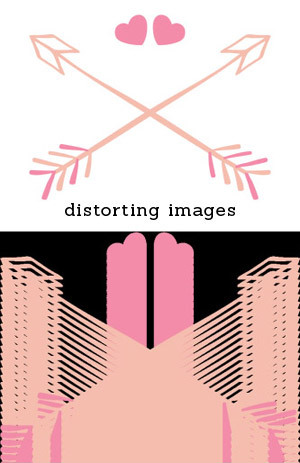 MY PNG IMAGES ARE DISTORTED. This can occur when software is not compatible with transparent PNG files. Try opening the artwork in your internet browser (right click - open in Chrome/Firefox/IE) or simply drag the artwork onto your browser icon. If the file opens correctly in your browser it may be a sign that the settings in the graphic editing software you are trying to open it in are not compatible. Try opening it in another graphics program, or googling the issue with your specific software version to see if there is an update. Please note that due to the digital nature of our artwork we cannot provide refunds for files that are not compatible with your software. We always recommend customers visit our Free page and download the free samples to check compatibility before purchasing. HELP! MY JPG IMAGES ARE OPENING WITH WEIRD FLURO COLORS! If your JPG images are opening like the picture on the bottom left it could be a sign that your software does not support CMYK color space. Try opening the image in another graphics program, or googling the issue with your specific software version to see if there is an update. The example on the left occurred in JASC Paint Shop Pro. CAN I USE LUNE ARTWORK IN DESIGNS I PLAN TO SELL? If you do not wish to provide credit, or it's not feasible/possible to provide a clickable credit link clearly beneath the artwork wherever it is used (such as logos, website designs, printed merchandise), you MUST purchase a Commercial License. This will allow you to use the artwork without credit. At no time can LUNE graphics be claimed as your own, offered or resold as-is. Graphics cannot be re-offered/sold on a solid background, they must be incorporated into part of your own design. LUNE graphics cannot be resold as-is on sites such as Zazzel or Cafepress. A Commercial Licence allows you to legally use our artwork without providing credit or any other form of payment back to us. • Commercial Licence - our standard licence, for runs of up to 1000 units. • Mass Production Licence - for runs of over 1000 units. CAN I USE LUNE GRAPHICS FOR MY LOGO? Personal and Small Business Owners: You may use our graphics as part of your logo, as long as you purchase a Logo Licence. For more high-view commercial usage please contact us. CAN YOU CREATE/ALTER ARTWORK FOR ME? Yes! Want help designing a custom project? Do you want to change the colours or size of a listing, but don't have the software or know-how? We can set you up a custom listing to suit your needs ♥ We can alter our existing designs to your specifications, or create entirely new art. Please visit our commissions page for more information, or send me a Convo on Etsy. CAN YOU CREATE ME ARTWORK FOR FREE? Due to time restraints we aren't available to take requests at this time. We are usually open for commissions, contact us if you'd like to discuss a commissioned project. DO YOU COLLABORATE WITH OTHER DESIGNERS/BLOGGERS? ARE YOU INTERESTED IN WHOLESALE INQUIRIES? Certainly! We are always excited by the prospect of new ventures and partnerships. Contact us to discuss further.